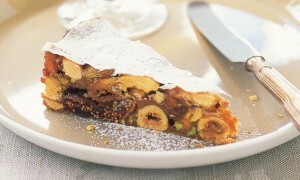 Panforte: Panforte is a traditional Italian dessert containing fruits and nuts, and resembles fruitcake or Lebkuchen. Literally, panforte means “strong bread” which refers to the spicy flavour. The process of making panforte is fairly simple. Sugar is dissolved in honey and various nuts, fruits and spices are mixed together with flour. The entire mixture is baked in a shallow pan. The finished cake is dusted with icing sugar. Commercially produced panforte often have a band of rice-paper around the edge. Preheat the oven on 150° C.
Roughly chop almonds, hazelnuts and pistachios and place in a large bowl. Add in the orange peel, apricots and figs. Sift the flour, cocoa powder and spices and mix through the nuts. Combine sugar, honey and butter in a non-stick pan on medium heat. Cook and low heat still the sugar dissolved and let it cook on higher heat for 3-4 minutes. Quickly mix the syrup through the dry mix. Scoop the mixture in a round tin (covered with baking paper) and press in in with youth fingers. Transfer the tin to wire rack and let cool completely to room temperature. Remove the baking paper and dust with icing sugar. Panforte is ready to be served. Cut the panforte into thin wedges and serve. If you have any queries regarding the Panforte recipe, please leave a comment.